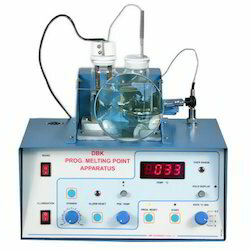 Pioneers in the industry, we offer automatic digital melting point apparatus from India. Our customers can avail from us a wide range of Melting Point Apparatus Automatic Digital. These are used to measure melting point of a variety of substances. Our range of apparatus is provided with special user friendly features, due to which these are extensively demanded all over the world. Cleaning Tool - 1 No. Looking for Melting Point Apparatus Automatic Digital ?